TracerDAQ: TracerDAQ is an out-of-the-box application that allows data to be generated, acquired, analyzed, displayed and exported within seconds of installing Measurement Computing data acquisition hardware. TracerDAQ has been completely redesigned to provide significant performance and feature improvements over previous versions. It now offers four different data acquisition applications; a Strip Chart, an Oscilloscope, a Function Generator and a Rate Generator, all of which are accessed via a common, easy-to-use menu page. 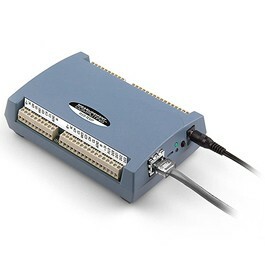 TracerDAQ is provided standard with all Measurement Computing PCI-and USB-based data acquisition products to get customers up and running quickly and efficiently. TracerDAQ Pro: TracerDAQ Pro provides four virtual instrument applications used to graphically display and store input data—and generate output signals—within minutes of installing Measurement Computing data acquisition hardware. The applications allow the user to customize appearance, store configurations for future use, save data to a file for export and—with the use of interactive hotspots—change settings while the application is running. UL for LabVIEW™: Library, VIs and program examples for LabVIEW. A comprehensive library of graphical functions comprising all the power of our Universal Library and InstaCal software. Many examples to get you started using LabVIEW while saving money with Measurement Computing instrument boards. UNIVERSAL-LIB/CD : Programming libraries for Windows Visual Studio programming languages, and others. A complete function library to simplify the configuration and operation of your measurement board. A single, universal set of functions operates all our products so you only have to learn to use our library once.